This tutorial explains how to use the free online tool mapshaper to convert between different map formats. It can also be used for map simplification, which is useful to reduce the map size (and loading time) for online map visualizations. Step 1. 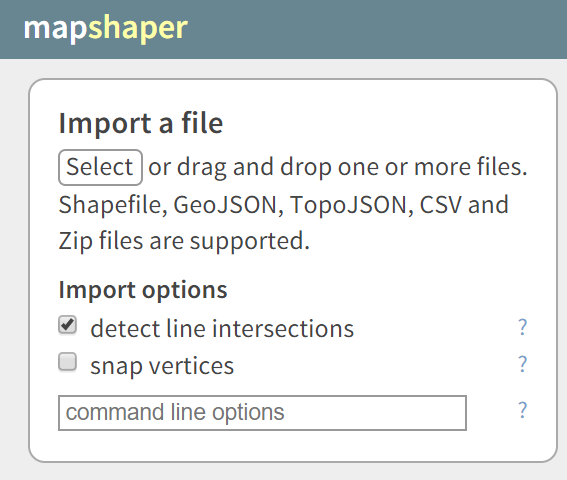 Open mapshaper.org, and click on select to attach your map files. GeoJSON map is just a single file, so you would only need to select one file for the conversion. Step 2. The map will display as shown below. 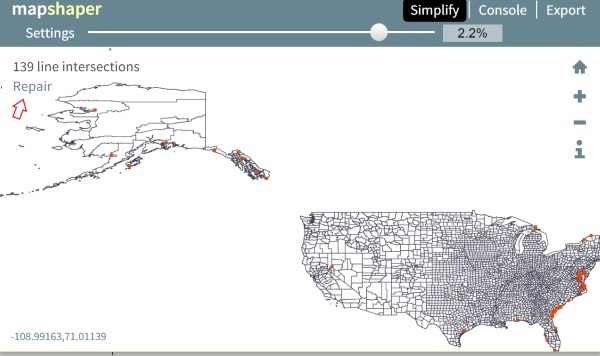 From here, you can first simplify the map, or export the map to Shapefile format (skip to Step 4 below if you do not need to simplify the map). Both options are in the menu in the top-right corner. If you wish to simplify the map first, make sure to select prevent shape removal as shown in the image below, then select Apply. 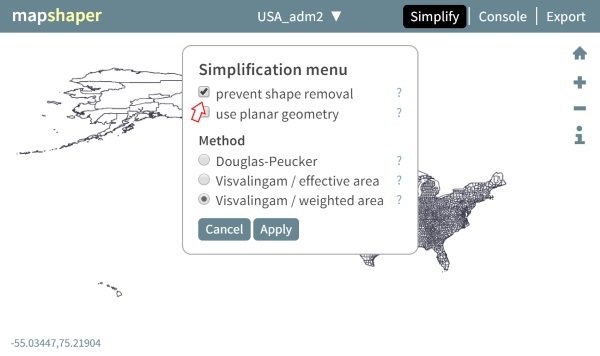 If you do not select this option, simplification may cause some map areas to disappear! Step 3. Drag the slider handle to the right to simplify the map, up to a level of detail you feel comfortable with. Often you can simplify up to 10 or 20 percent without such a noticeable loss in detail, but you may wish to zoom in to see what it looks like up close. The percentage is shown to the right of the slider - and is an indication of how much the file size will be reduced. Sometimes simplification leads to intersections, so click on repair in the top-left corner to fix these (if mapshaper cannot fix them, you could just leave them in, as they are often not so obvious as long as you do not zoom in close). Step 4. Click on Export to save the map in various formats. 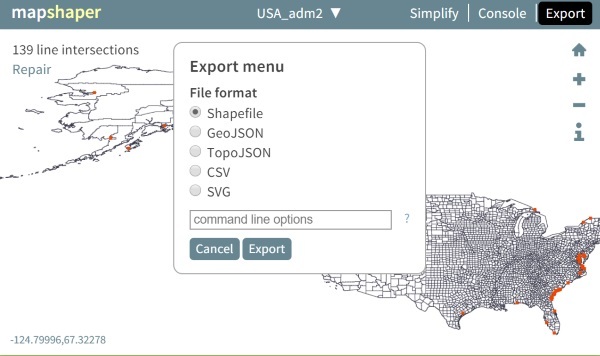 Select Shapefile to convert the GeoJSON map to this format, and then click on Export.